Richmond, Virginia, U.S. – April 15, 2013 – SoftChalk, LLC, a leading developer of content authoring solutions for e-Learning, today announced the three winners and honorable mentions for its annual Lesson Challenge. The Lesson Challenge contest runs from November through January each year and gives SoftChalk enthusiasts a chance to show off the innovative content they have created with SoftChalk’s content authoring solutions. All entries are shared by their author on SoftChalk Cloud, SoftChalk’s learning object repository and content authoring platform. The entries are reviewed by a panel of leading online educators and scored using subset of the Quality Matters judging rubric with specific categories including lesson creativity, professionalism, interactivity, and how well the lesson reinforces student learning. This year’s winning lessons include the 1st place grand-prize winner, Anna Raumaker of College of the Mainland with a lesson titled Little Things Mean a Lot, the 2nd place prize winner, Alli Houston of Georgia Virtual School with Advanced Web Design, and the 3rd place winner, Joshua Farquharson of Allied Health Tools LLC with a lesson titled Physical Examination: Body Positioning. Five honorable mentions were also selected. Judy Macdonald of St. Petersburg College with a lesson titled, SPC-ELL: Identifying Parts of Speech; Karen Waggoner of Midland College with Waggoner – PLATE TECTONICS; Robert Hiles of Newport-Mesa Unified School District with Module 5L; Samita Ghoshal of University of Houston Downtown with Human Anatomy and Physiology Chapter 4; and Jennifer Gray of Austin Community College with Distance Learning Instruction Series. 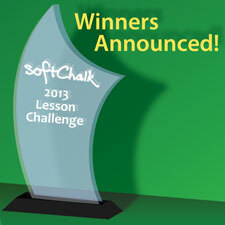 For more information and to view the winning lessons, visit the 2013 SoftChalk Lesson Challenge Winner Showcase. SoftChalk, LLC is an award-winning provider of eLearning software for worldwide education and business institutions. Specializing in the development of intuitive, easy-to-use tools, SoftChalk products allow instructors to create powerful and professional-looking content for eLearning and smart classrooms in K-12, higher education and corporate training. For more information, visit www.softchalk.com.